Have you ever tried to use the Lord’s Prayer as a guide for your prayer life? Though succinct, it covers all aspects of life. 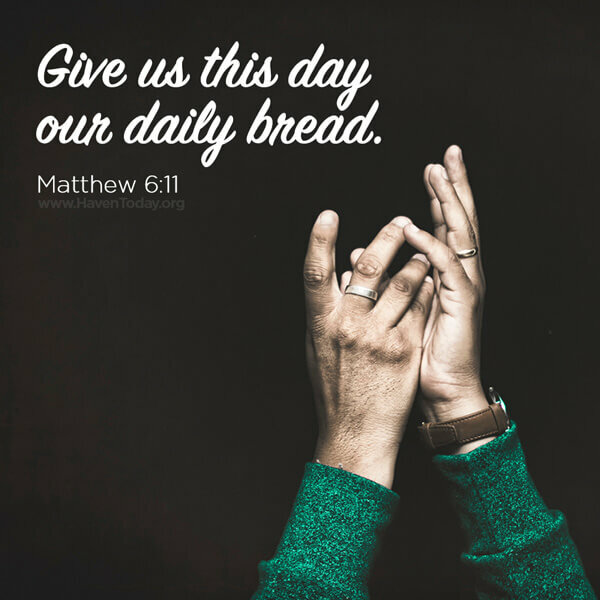 After you pray that God’s name would be held high and ask for His kingdom to come and His will to be done, you make your request for daily bread. But what exactly is it you are hungering for? What are your needs and deep longings? He knows our true needs. He also knows which of our longings are rooted in Him and which are rooted in our own selfish desires. In the quietness of the morning, I reflect upon the day before me, and those answers begin to come to the fore. Yes, many of our needs are of a physical nature. We dare not take for granted that we have food, clothing, and a roof over our heads. But our greater need is to know Jesus Christ, the Bread of Life, the true nourishment for our souls. And like the Israelites who wandered in the wilderness, we too need our Daily Bread, provided to us fresh and in perfect measure each and every morning. Our loving Lord faithfully feeds us!